Famed whistleblower [Edward Snowden] has recently taken to YouTube to announce Haven: an Open Source application designed to allow security-conscious users turn old unused Android smartphones and tablets into high-tech monitoring devices for free. While arguably Haven doesn’t do anything that wasn’t already possible with software on the market, the fact that it’s Open Source and designed from the ground up for security does make it a bit more compelling than what’s been available thus far. Developed by the Freedom of the Press Foundation, Haven is advertised as something of a role-reversal for the surveillance state. 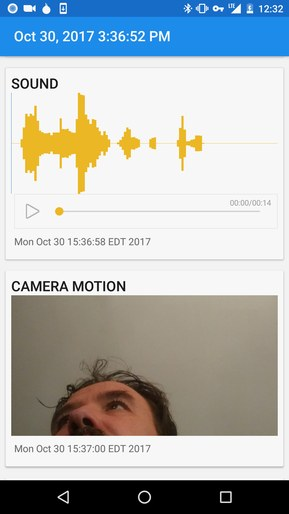 Instead of a smartphone’s microphone and camera spying on its owner, Haven allows the user to use those sensors to perform their own monitoring. It’s not limited to the camera and microphone either, Haven can also pull data from the smartphone’s ambient light sensor and accelerometer to help determine when somebody has moved the device or entered the room. There’s even support for monitoring the device’s power status: so if somebody tries to unplug the device or cut power to the room, the switch over to the battery will trigger the monitoring to go active. Thanks to the Open Source nature of Haven, it’s hoped that continued development (community and otherwise) will see an expansion of the application’s capabilities. To give an example of a potential enhancement, [Snowden] mentions the possibility of using the smartphone’s barometer to detect the opening of doors and windows. With most commercially available motion activated monitor systems, such as Nest Cam, the device requires a constant Internet connection and a subscription. Haven, on the other hand, is designed to do everything on the local device without the need for a connection to the Internet, so an intruder can’t just knock out your Wi-Fi to kill all of your monitoring. Once Haven sees or hears something it wants you to know about it can send an alert over standard SMS, or if you’re really security minded, the end-to-end encrypted Signal. The number of people who need the type of security Haven is advertised as providing is probably pretty low; unless you’re a journalist working on a corruption case or a revolutionary plotting a coup d’etat, you’ll probably be fine with existing solutions. That being said, we’ve covered on our own pages many individuals who’ve spent considerable time and effort rolling their own remote monitoring solutions which seem to overlap the goals of Haven. So even if your daily life is more John Doe than James Bond, you may want to check out the GitHub page for Haven or even install it on one of the incredibly cheap Android phones that are out there and take it for a spin. There’s a big to-do going on right now in Germany over particulate-matter air pollution. Stuttgart, Germany’s “motor city” and one of Dante’s seven circles of Hell during rush hour, had the nation’s first-ever air pollution alert last year. Cities are considering banning older diesel cars outright. So far, Stuttgart’s no-driving days have been voluntary, and the change of the seasons has helped a lot as well. But that doesn’t mean there’s not a problem. But how big is the issue? And where is it localized? Or is particulate pollution localized at all? These questions would benefit from a distributed network of particulate sensors, and the OK Lab in Stuttgart has put together a simple project(translated here) to get a lot of networked sensors out into the wild, on the cheap. The basic build is an ESP8266 with an SDS011 particulate sensor attached, with a temperature and humidity sensor if you’re feeling fancy. The suggested housing is very clever: two 90° PVC pipe segments to keep the rain out but let the dust in through a small pipe. The firmware that they supply takes care of getting the device online through your home WiFi. Once you have it running, shoot them an e-mail and you’re online. If you want help, swing by the shackspace. We love these sort of aggregated, citizen-science monitoring projects — especially when they’re designed so that the buy-in is low, both in terms of money spent and difficulty of getting your sensor online. This effort reminds us of Blitzortung, this radiation-monitoring network, or of the 2014 Hackaday-Prize-Winning SATNOGS. While we understand the need for expensive and calibrated equipment, it’s also interesting to see how far one can get with many many more cheap devices. [Tyler S.] has built a home automation and monitoring system dubbed ED-E, or Eddie. The name is an amalgam of its two main components, the Edison board from Intel, and some ESP8266 modules. ED-E’s first job is to monitor the house for extraordinary situations. It does this with a small suite of sensors. It can detect flame, sound, gas, air quality, temperature, and humidity. With this array, it’s probably possible to capture every critical failure a house could experience, from burglars to water pipe leaks. It uploads all this data to Intel’s Analytics Cloud where we assume something magical happens to it. ED-E can also sense the state of other things in the house, such as doors, with remote sensors. The door monitors, for example, are an ESP8266 and a momentary switch in a plastic case with a lithium ion battery. We’re not sure how long they’ll run, but presumably the Analytic Cloud will let us know if the battery is low via the aforementioned magic. Lastly, ED-E, can turn things in the house on and off. This is accomplished in 100% Hackaday-approved (if not UL-approved) style with a device that appears to be a lamp cable fed into a spray painted Altoids tin. ED-E wins some style points for its casing. It’s a very well executed hack, and we’d not previously considered just how many awful situations can be detected with off the shelf sensors. [Jay Kickliter] writes in to tell us about his open source energy/power meter. 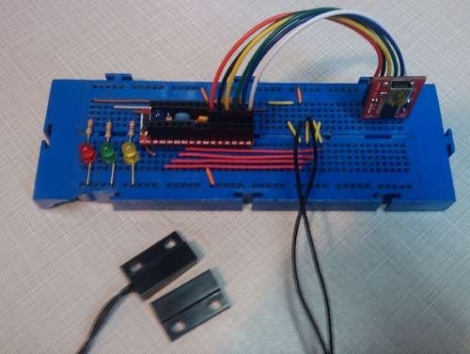 With his buddy [Frank Lynam] they designed a small device that crams into existing power boxes and uses and 8 core propeller (P8X32A) microcontroller to perform true RMS voltage and current measurements using a current transformer. [Frank] and [Jay] don’t stop there. The meter also features an xbee pro 900 MHZ to provide wireless (and even mesh networking) capabilities to the whole ordeal. [Jay and Frank] estimate a total unit cost of around $80 (US) per prototype. With volume the price goes down by about half. With a larger number of units, and the magic of mesh networking, we could see cheaper xbee’s driving the cost down some. Check out the Google code page for details or the schematic (pdf) if you are interested. So far the project is in the beta stages, and only features a single module sending data to a PC running an OS X Cocoa application. [Jay] is about to be otherwise occupied by the Merchant Marines and [Frank] the Navy, so they figured we could have a go at it for awhile. We have seen other hardware used to monitor power consumption, but cramming this circuit into each power box is a neat idea. [Frank] explains the whole project in the video after the jump. [BrianH] decided that he no longer wanted to venture outside on cold or rainy days just to check if the mail had come, so he built himself a notification system that would alert him if the postman had stopped by. Additionally, he admits to being forgetful on occasion and wanted a way to monitor whether or not he forgot to close the garage door. His Instructable details how he accomplished both of these tasks with the household monitor he built around an ATmega168. 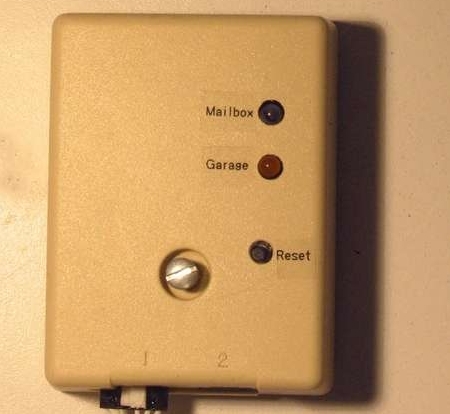 His project uses a mailbox mounted photoresistor to determine when the mailbox has been opened, and a reed switch that is triggered when the garage door has been opened. If either of these things occur, a beep is emitted from his notifier, and the appropriate status LED is lit. Simply monitoring whether the garage door has been opened is not all that helpful, so he programmed his notifier to beep persistently at 10-minute intervals if the garage has been left open for more than an hour. His hack is pretty useful, but he does mention that there is an inordinate amount of wiring that needs to be laid, citing his driveway repaving as a great opportunity to do so. [Bill Porter] has joined in the pursuit of an inexpensive yet effective way to monitor his power usage. He calls his project the Not So Tiny Power Meter, and shared both his successes and follies involved in seeing it through to implementation. There are problems; sizing issues with enclosures and his PCB, issues with noise when measuring low-current signals with the clamps, and even some wireless communications issues. But it looks like he’s got the system running despite these hurdles. Right now it streams data wirelessly so that he can display the current energy consumption, but he plans to add Google Power Meter functionality next. We’ve seen commercial units using the same sensing principles that have been hacked to show data online.